How Does a Potato Clock Work? How Do Fruit Batteries Power an LED Light? Science experiments help children and young adults learn why things are the way they are or how things work. One popular experiment is using a potato to run a small LED lightbulb or clock. Contents of the potato help the small electronic item work and explain to the child scientist how electricity works. This experiment is often called the potato battery. Potatoes naturally contain salt, one of the most important ingredients for conducting electricity. In electricity, salt is important for conducting the current in the form of ions. When combined with water, the salt breaks apart into separate ions, conducting positive and negative charges to power the small electronic device. 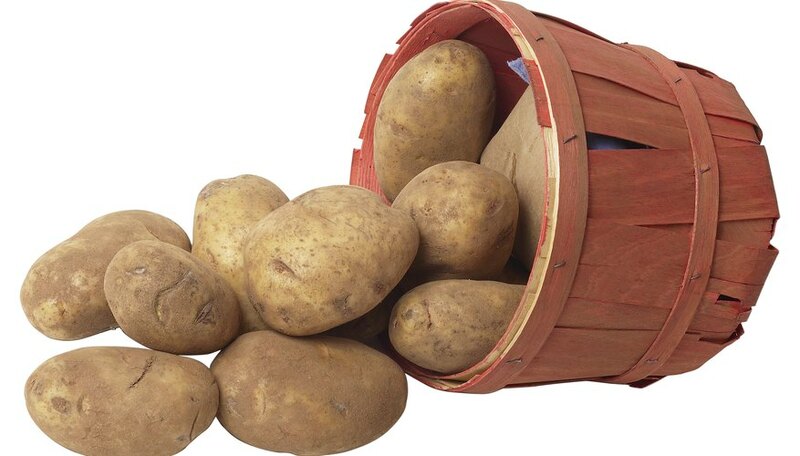 Water is contained naturally in potatoes; however, soaking the potato overnight in water will help it conduct even more electricity. The water helps the salt in the potato break apart into separate ions. Pure water alone will not conduct electricity, but pure water is hard to produce and doesn't stay pure for long. Water found in potatoes is not pure water and will conduct electricity because of the contaminants and ions contained in the potato. Water combines with salt to produce electrolytes, a key ingredient in conducting electricity. Every potato contains cells. These cells are in the form of water and salt, mentioned earlier, as well as the "meat" and skin of the potatoes. The electricity travels through these other cells because of the water and salt. Without water and salt combined to make electrolytes, a potato would not be acidic enough to conduct electricity. By itself, the potato will not conduct electricity to small electronics. You need electrodes stabbed into the potato to release the electricity. The potato provides the buffer to conduct electricity to the small electronic device. Electrodes should be made of copper and zinc -- most often used are copper pennies and zinc nails. The metals react with the contents of the potato electrochemically to conduct electricity across the potato and into the electronic device. Joanie Reeder is a professional writer, editor and photographer with more than 10 years of experience in the news industry. Published works have appeared within the Associated Press, the "Salisbury Post" and the "Kannapolis Citizen." She holds a Bachelor of Arts from Catawba College in Salisbury, N.C., with a concentration in mass media and journalism. Reeder, Joanie. "Contents of the Potato That Can Conduct Electricity." Sciencing, https://sciencing.com/contents-potato-can-conduct-electricity-8715648.html. 24 April 2017. What Are Some Possible Materials You Could Use to Make a Battery?